There are moments when unity, empathy and humanity can save lives. Today, such a moment has arrived. Our colleague, Saveta Denghel, 46 years old, was diagnosed one and a half years ago with glioblastoma, the most aggressive form of brain cancer. Saveta received support from friends and colleagues who remember her wit and her kindness, she always has a nice word for everybody around her. 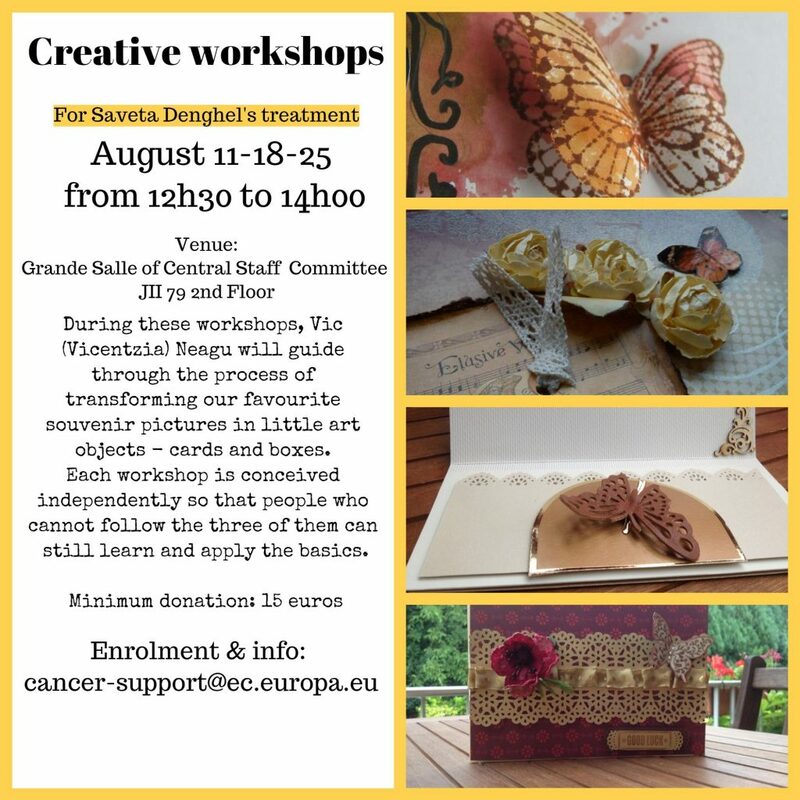 CANCER SUPPORT GROUP organises a series of events to fundraise for Saveta’s treatment, the first being a series of three creative workshops in this month of August around the theme of “souvenirs” and postcards. During these workshops, Vic (Vicentzia) Neagu will guide through the process of transforming our favourite souvenir pictures in little art objects – cards and boxes. Each workshop is conceived independently so that people who cannot follow the three of them can still learn and apply the basics. On 11 and 18 August we will work with cards – postcards, cards for various occasions (birthday, marriage, new child etc) and on 25 August we will decorate a box. You can bring your own ribbons, coloured paper, glue, holidays or family pics, glitter, colours, crayons, bits of tissue or gift paper – leaves, fruits, dried flowers… the possibilities are infinite.